Gratitude for all my company here, alive and seem-alives. 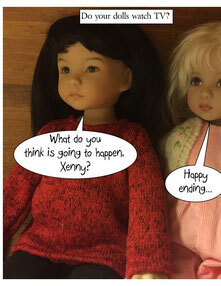 And thanks to all my dollhead readers and explorers! Toy Story reruns were played almost daily! And we watched a movie called Mr. Magorium's Wonder Emporium, with Dustin Hoffman, Natalie Portman, and Jason Bateman. A toy store comes alive! Lots of great scenes. Zoey likes to look ahead. Xenny wants things to turn out in the end. 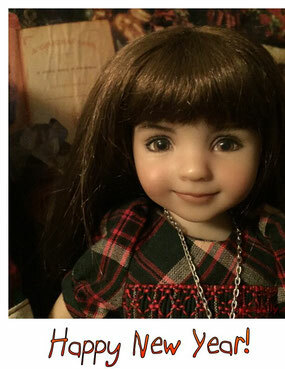 We got you a doll! Yes, that's a golden acupuncture doll. We got it for Grace, our South Korean Traditional Chinese Acupuncturist and friend. Before we wrapped this dolly, we all got a good look at her. Little Darling Chantal is fascinated. G asked if the meridians were correct. Hmmm. Doesn't matter! But what a bonus it would be, eh? 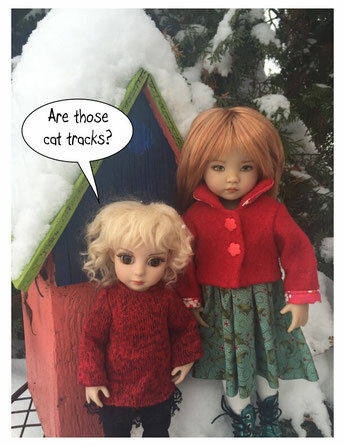 A couple of friends took Dolltown dolls on holiday road trips! Such good friends! The dollies love Aunt Jacalyn and Auntie M...adventures! Can anyone say Calgary hockey game? It's a reconnaissance mission. The girls have come out with me to the Doll Studio while I take some photos. They know it's been snowing again. They want a Snow Play day. Is there enough snow? Is there any sign of animals? Zoey and Scout are impressed with the snow. Not so impressed with the cat tracks Gabby saw. But it won't stop them! 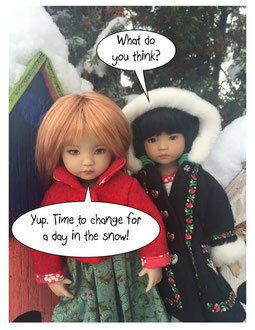 Tink, Chantal, and the other Little Darlings have heard the go-ahead and are changing into warm clothes. Faith is very excited to play in the snow. We think it's her first time! The boys, overhearing the Little Darlings, are scrambling for coats and boots. Will they have to take turns with the winter clothes?